This entry was posted on January 30, 2012 by Van Rental. P&O’s second new ferry for the Dover-Calais route, the Spirit of France, has arrived in Dover. The Spirit of France is an identical sister ship to the Sprirt of Britain, which entered service in January 2011. The two new ferries, which cost €180m each, are the largest ever built for operation in the Dover Straits and provide nearly double the capacity of the ships they replace, the Pride of Dover and the Pride of Calais. The Spirit of France can carry up to 180 lorries and 195 cars, plus 1,750 passengers. It has a whopping 3,746m of vehicle lanes – if loaded only with cars, it could carry more than 1,000, as opposed to 650 on the current ferries. P&O plans to keep the two new ferries in service on this route for the next 25 years, mirroring the successful careers of the two Pride ships. The Spirit of France is expected to enter service in mid-February – apparently, the first available booking date is currently on the 1520 sailing on 9th February 2012. This entry was posted on February 9, 2011 by Van Rental. Brittany Ferries is launching a new UK-Spain ferry route from Portsmouth to Bilbao. 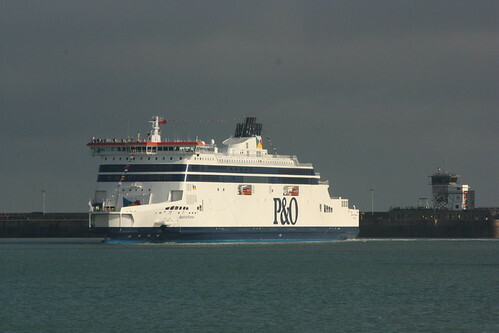 In September 2010, P&O Ferries discontinued its Portsmouth – Bilbao ferry service. This meant that the only remaining option for UK-Spain ferries were Brittany Ferries’ services from Portsmouth and Plymouth to Santander. The service will initially run from Portsmouth on Sundays and Fridays and from Bilbao on Tuesdays and Saturdays. The sailings will take 24 hours, except for the Sunday sailing which will call at Roscoff for supplies and a crew change and thus will take 32 hours. If you are heading for the east coast of Spain (e.g. Valencia, Alicante, Murcia), then you will save a little time if you start from Bilbao. Similarly, the more westerly port of Santander might be a better starting place for the Algarve, but the difference is not huge as Bilbao and Santander are only around 60 miles apart. The Brittany Ferries Portsmouth-Bilbao service starts running on 27th March 2011 – click here for more details. This entry was posted on November 22, 2010 by Van Rental. P&O is preparing to bring into service the largest ferries ever used in the Channel. The first ship, the Spirit of Britain, will replace the Pride of Dover from the 23rd January 2011 and will provide nearly double the capacity of the ship it replaces. The first sailing is currently scheduled for 0415 on the 23rd January. The Spirit of Britain will be able to carry up to 180 lorries and 195 cars, plus 1,750 passengers. It has a whopping 3,746m of vehicle lanes – if loaded only with cars, it could carry more than 1,000, as opposed to 650 on the current ferries. The Spirit of Britain and its sister ship the Spirit of France will be the largest ferries ever operated in the Channel and have been designed to ‘Dover Max’ size – the largest ships that can be handled by the existing ferry port facilities in Dover, Calais and Boulogne (for those times when striking French workers put Calais out of bounds…). Each of the new ships weights 49,000 tonnes, is 213m long and is expected to operate on this route for 25 years – as have the existing ships. This entry was posted on September 1, 2010 by Van Rental. For Brits moving to and from Spain, the P&O Ferries Portsmouth-Bilbao ferry service has always been a popular option – instead of a long slog driving through France, you can enjoy a mini-cruise down the coast of France with two night’s rest in a proper cabin. Once you reach Bilbao, many popular Spanish destinations can be reached within a day’s driving. Luckily, there is an alternative and more attractive option for ferries from UK-Spain. Brittany Ferries runs a service to Santander, which sails from both Portsmouth and Plymouth (alternately). This service is actually faster – only taking around 24 hours – and uses newer ships than the P&O service. Click here for a quote from Brittany Ferries if you’re planning a trip to or from Spain. This entry was posted on February 17, 2010 by Van Rental. If you’re planning on booking a ferry crossing to take a van across the Channel to France (or Spain, Ireland or even Denmark) then you’ll need to remember certain things when booking it. Size does matter. You’ll need to specify the length and height of your van when booking a ferry and may be charged an additional cost per metre (length) if you are found to have understated the length of your van. Don’t forget to include the dimensions of any towbar, roof rack, bicycle rack or other attachment in the total length and height of your van. The cheapest ferry crossings are normally on the shortest routes – in other words, Dover-Calais. Ferry prices vary enormously – you will find that changing the day and the time will affect the price. Travelling in the early hours of the morning can work out cheaper, but don’t go without sleep to do it. Larger vans may have to be booked as freight vehicles – different ferry companies have different policies on this. If you are transporting goods for money then you should do this anyway. If you are simply moving house (for example) then you may be able to book at normal rates. To get the latest ferry prices from all the major ferry operators, visit our Ferry Booking page now.